Built in 1905 as a companion to the Novello, the history of the Aldwych is distinguished by two very different periods of notoriety. The theatre first gained popularity housing a series of farces by Ben Travers between 1923 and 1933 which became known as ‘The Aldwych Farces.’ Diversely, nearly thirty years later, The Royal Shakespeare Company acquired the Aldwych as their London base, and for the next 21 years, the Aldwych was the home of Shakespeare in the capital. The early years of the theatre, under the management of Seymour Hicks and Charles Frohman, saw musical comedies take precedence on the Aldwych stage. The opening production, Blue Bell, starred the Aldwych’s own Mr Hicks. He and his wife Ellaline Terriss frequently featured in musical comedies at the theatre over the next few years. The Aldwych was a venue renowned for the quality of its productions and names such as Charles B Cochran, Viola Tree and Donald Calthorp who were all associated with the Aldwych prior to the success of ‘The Aldwych Farces’. Travers’ farces including familiar titles such as A Cuckoo in the Nest, Rookery Nook, Plunder and A Cup of Kindness, and delighted audiences for over a decade with noted actors of the period including Tom Walls, Ralph Lynn, Mary Brough, Winifred Shotter and Robertson Hare. By the early 1940s ownership of the theatre was in the hands of the Abrahams family and for a significant period, the Aldwych was managed by Prince Littler. The 1940s saw plays such as Lillian Hellman’s Watch on the Rhine, Gertrude Lawrence in Daphne Du Maurier’s September Tide and Vivien Leigh in A Streetcar named Desire take residence at the theatre. In the following decade the Aldwych continued to host acclaimed productions including The Dark is light enough by Christopher Fry and Peter Sellers in Brouhaha. In the 1960s the Aldwych entered its second period of great notoriety, which varied vastly from its time as the home of the farce. On 15 December 1960, The Royal Shakespeare Company took over the Aldwych and for the next twenty-one years brought every well known British actor to its stage in Shakespearean productions as well as other memorable plays such as The War of the Roses, The Greeks and Nicholas Nickleby. 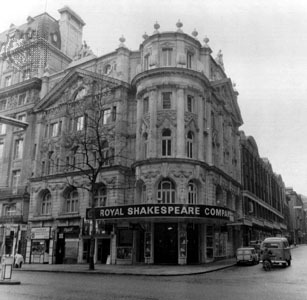 The departure of the RSC in 1981 did nothing to slow the success of the Aldwych. The 1980s saw productions such as A View from the bridge, The Cherry Orchard by Chekhov starring Judi Dench, Noel Coward’s Private Lives, Brand by Ibsen and Tango Argentino continued to keep the Aldwych firmly at the forefront of the West End. This success continued into the 1990s most notably with The Cotton Club, a musical based on the 1920s Harlem venue of the same name, Dame Maggie Smith also starred as Lady Bracknell in The Importance of Being Earnest which opened in 1993 and David Suchet and Diana Rigg took to the Aldwych stage in Who’s Afraid of Virginia Woolf? in 1996. 2002 saw the start of a musical era at the theatre, Fame, based on the 1980s film of the same name opened and enjoyed a successful run of three and a half years. This was followed by Motown musical Dancing in the Streets, before the smash hit Dirty Dancing opened at the Aldwych and ran for nearly five years, making it the longest running show in the Aldwych’s history. Short runs of Cool Hand Luke starring Marc Warren, A Round-Heeled Woman starring Sharon Gless and Midnight Tango followed before the Olivier award-winning Irving Berlin's Top Hat opened in April 2012. The show ran for 18 months followed by the world premiere of Andrew Lloyd Webber's Stephen Ward which opened in December 2013. The Royal Shakespeare Company returned to the Aldwych in 2014 with stage adaptations of Hilary Mantel's award-winning novels Wolf Hall and Bring up the Bodies. Dance 'til Dawn starring Strictly Come Dancing's Vincent Simone and Flavia Cacace saw out 2014 before the European premiere of Beautiful: The Carole King Musical in February 2015. Nominated for 8 Olivier Awards in 2015, Katie Brayben who played the title role went on to win the award for Best Actress in a Musical alongside her co-star Lorna Want who clinched the award for Best Supporting Actress in a Musical for her portrayal of Cynthia Weil. A mainstay of the West End for over 110 years The Aldwych continues to attract audiences from across the globe and delight the house with productions night after night.